This versatile and lightweight Pole Pruner is perfect for any trimming job, with an adjustable height feature you can tackle hard to reach branches and with an 8 inch cutting bar you're always assured a clean, easy cut. Robust 20cm (8in) steel bar and chain with tool-less chain tensioning offers ease of use while delivering the highest cutting performance. Automatic oiler applies oil to bar and chain when needed to ensure durability and optimal use with a translucent oil tank for clear view of oil level. 3 piece aluminium shaft to accommodate operator's height can be extended to 244cm (8ft) and collapse down to 150cm (5ft) for versatile cutting reach. Easy chain tensioning adjustment enables you to easily check and tighten your chain for the best use. Rear handle lock-off switch helps prevent accidental start-ups. Make easy work of your hedges and bushes with the Greenworks 24V Lithium-ion Battery Hedge Cutter. 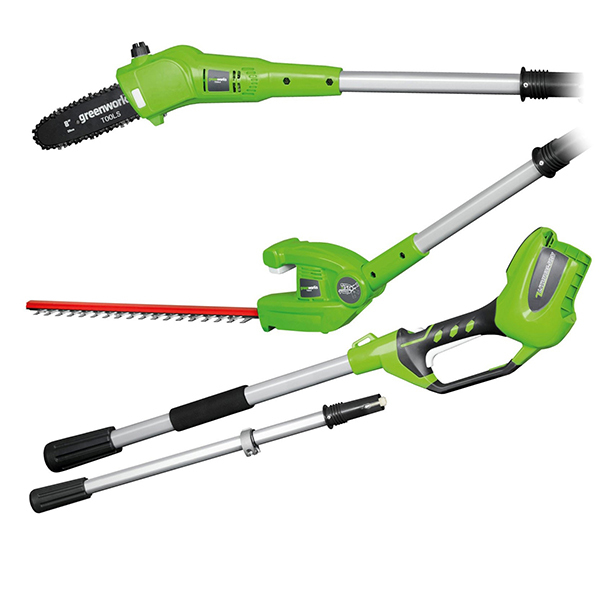 Many hedge trimmers are heavy to handle and loud, but with the Greenworks Hedge Cutter's lightweight body and emission-free long reach trimmer, grooming your garden couldn't be easier. Delivering petrol performance at a fraction of the cost or fuss, this easy-to-use garden tool features the most advanced battery technology in the industry. Greenworks' lithium-ion batteries are lightweight, superior quality units that offer full power for the whole duration of each charge, and can be re-charged up to 2000 times. They have 3-4 times the life span of Nickel Cadmium batteries, offering years of successful operation. The same 24V battery can be used in any 24V Greenworks tool giving you the total solution to Gas free garden care. Gas free is quieter and all Greenworks products have zero carbon emissions for guilt-free gardening. 125-degree rotating head to help you get the perfect cut and dual action blades for smooth cutting.